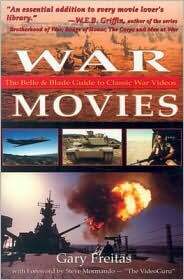 There are many books and types of books one can consult when interested in the topic of war movies. The first that come too mind are the movie guides. There are some very fine examples of that kind out there (War Movies, Under Fire.…) The next category one would look into are historical books, first hand accounts and the like (A Rumor of War, Band of Brothers, We Were Soldiers Once…). Finally there are a lot of novels that have been the basis for one or the other movie (The Thin Red Line, Catch 22, Regeneration, All Quiet on the Western Front...). Since I mentioned Gary Freitas before I would like to dedicate this entry to one hell of a fine book, his War Movies: The Belle & Blade Guide to Classic War Videos. I truly enjoy it every time I take it out and consult it. Freitas did a fine job in reviewing a big number of movies (347), in rating them and telling you exactly why he thinks they work or why not. He doesn’t shy away from criticising films that are generally well-respected if he disagrees with the overall opinion. His wit and sarcasm are priceless. I laughed quite a few times when reading one or the other entry. The book is organized alphabetically but contains a lot of useful genre lists like Best War Satire, Best War Romances, Best POW Movies, Best Action Adventure to name but a few. Additionally there are lists dedicated to the different wars, Best Korean War Movies, Best WWI, Best Vietnam etc. I wouldn’t say I always agree with his views, especially since he doesn’t like the older classics and doesn’t think hardly any Air Combat movie worthy to get a high rating (probably often too propagandist for his taste) but I discovered many a gem through him and, as said before, I really like his sense of humor and the way he makes fun of bad movies (there are many, believe me). As he would say: Go buy this book immediately. Now! There aren’t many better ones out there. This entry was posted in Books, Movie Guides. Thanks for the recommendation. I am going to go to Amazon and order it. I don’t think you will regret it. Under Fire is good too, different, essays rather. The review got me a comment from the editor. I was really pleased. Thanks. I enjoyed it a lot.